The section below about safe area insets was updated on Oct 31, 2017 to reflect changes in the iOS 11.2 beta. The inset area is filled with the page’s background-color (as specified on the <body> or <html> elements) to blend in with the rest of the page. For many websites, this is enough. If your page has only text and images above a solid background color, the default insets will look great. While reading this post you can tap on any of the images to visit a corresponding live demo page and take a peek at the source code. After reloading, the navigation bar looks much better, running from edge to edge. However, it is immediately clear why it is important to respect the system’s safe area insets: some of the page’s content is obscured by the device’s sensor housing, and the bottom navigation bar is very hard to use. Use `viewport-fit=cover` to fill the whole screen. The next step towards making our page usable again after adopting viewport-fit=cover is to selectively apply padding to elements that contain important content, in order to ensure that they are not obscured by the shape of the screen. This will result in a page that takes full advantage of the increased screen real estate on iPhone X while adjusting dynamically to avoid the corners, sensor housing, and indicator for accessing the Home screen. The safe and unsafe areas on iPhone X in the landscape orientation, with insets indicated. 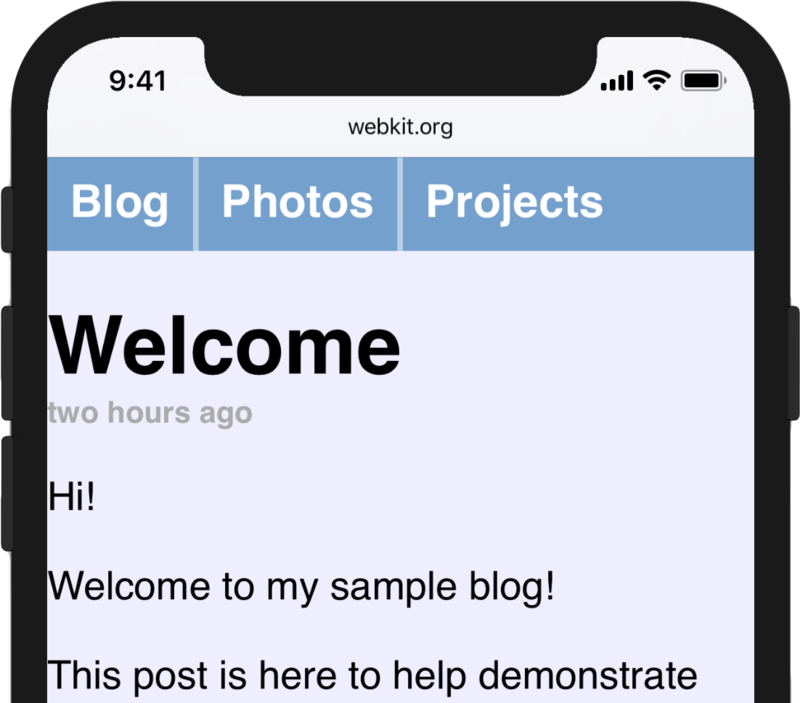 To achieve this, WebKit in iOS 11 includes a new CSS function, env(), and a set of four pre-defined environment variables, safe-area-inset-left, safe-area-inset-right, safe-area-inset-top, and safe-area-inset-bottom. When combined, these allow style declarations to reference the current size of the safe area insets on each side. For browsers that do not support env(), the style rule that includes it will be ignored; for this reason, it is important to continue to separately specify fallback rules for any declarations using env(). Respect safe area insets so that important content is visible. This section covers features that are available starting in Safari Technology Preview 41 and the iOS 11.2 beta. If you adopt safe area insets in your website design, you might notice that it is somewhat difficult to specify that you want a minimum padding in addition to the safe area inset. In the page above, where we replaced our 12px left padding with env(safe-area-inset-left), when we rotate back to portrait, the left safe area inset becomes 0px, and the text sits immediately adjacent to the screen edge. Safe area insets are not a replacement for margins. To solve this, we want to specify that our padding should be the default padding or the safe area inset, whichever is greater. This can be achieved with the brand-new CSS functions min() and max() which will be available in a future Safari Technology Preview release. Both functions take an arbitrary number of arguments and return the minimum or maximum. They can be used inside of calc(), or nested inside each other, and both functions allow calc()-like math inside of them. It is important to use @supports to feature-detect min and max, because they are not supported everywhere, and due to CSS’s treatment of invalid variables, to not specify a variable inside your @supports query. In our example page, in portrait orientation, env(safe-area-inset-left) resolves to 0px, so the max() function resolves to 12px. In landscape, when env(safe-area-inset-left) is larger due to the sensor housing, the max() function will resolve to that size instead, ensuring that the important content within is always visible. Use max() to combine safe area insets with traditional margins. You can start adopting viewport-fit and safe area insets today, by using Safari in the iPhone X Simulator included with Xcode 9. 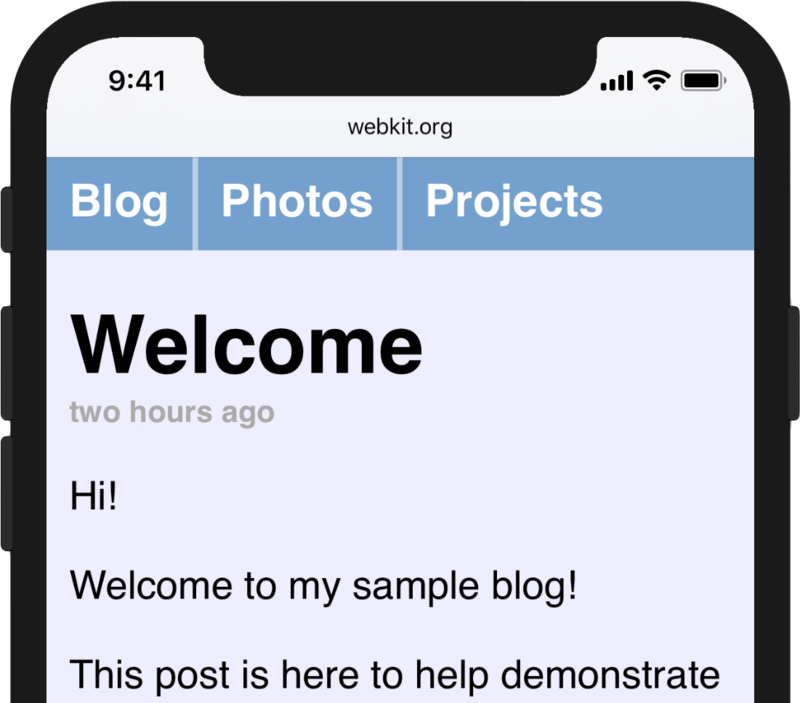 We’d love to hear how your adoption of all of these features goes, so please feel free to send feedback and questions to web-evangelist@apple.com or @webkit on Twitter, and to file any bugs that you run into on WebKit’s bug tracker.